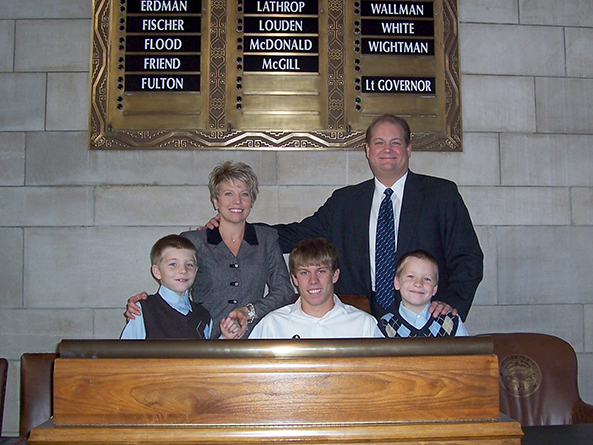 Above: Sen. Lautenbaugh’s dedication to public service culminated in his appointment to the Legislature. Sen. Scott Lautenbaugh has been working his way through a thick biography of Winston Churchill. He said he keeps it on his nightstand and tries to pick it up each night before bed. Lately, however, he has only made it through a few pages before falling asleep. Since his appointment to the Legislature last November, that progress may slow even more. But that fact doesn’t seem to bother Lautenbaugh. “It’s a tremendous opportunity to serve the public,” he said. Lautenbaugh replaces Sen. Mick Mines, who resigned last October. Lautenbaugh, who lives in northwestern Douglas County, represents District 18, which includes Blair, Fort Calhoun, portions of northwest Omaha and parts of rural Douglas and Washington counties. Although new to the Legislature, Lautenbaugh is not new to public service. His interest in politics can be traced back to his high school days at Omaha South High School. He became interested in politics during the Reagan administration in the waning years of the Cold War era, and in 1992 he attended his first county party convention. Lautenbaugh served as Douglas County Election Commissioner from 2000 to 2003 after having served as the county’s chief deputy commissioner since 1996. He is an attorney in private practice and received his undergraduate and law degrees from Creighton University. Lautenbaugh said he sees a lot of potential in this year’s legislative session. Already, there have been opportunities for learning, he said. From area farmers concerned with the deer population to the civic leaders in Blair, Lautenbaugh said he’s met with a variety of constituents. And he wouldn’t have it any other way, as he said that listening is a key part of being an effective legislator. “I feel like I’m ready to hit the ground running, but I’ll never stop learning from my constituents” he said. There’s likely to be a lot of running around for Lautenbaugh, whether it’s around the Capitol, between Lincoln and his Omaha law practice or to and from his sons’ sporting events. Lautenbaugh and his wife, Shelly, have three boys. Spencer is 18 and and plays on his high school football and baseball teams. Nathan and Kyle are 8-year-old twins, who play basketball and baseball. Lautenbaugh said he plans to make it to all the games. And while his new responsibilities at the Legislature may complicate that endeavor, Lautenbaugh said he’s ready for the challenge. “It’s an honor to serve, and I’ll work hard at it” he said.